Michael McFadyen's Scuba Diving - Ekkai Maru In late September 1944 with some Japanese ships, including a convoy of 12 Japanese ships, taking refuge in the Busuanga Island area of the Northern Palawan group of the Philippines. Eight of the ships were anchored in Coron Bay, the rest to the west and at least one on the northern side of Busuanga Island. The Ekkai Maru was anchored in the area between Tangat and Lusong Island with a number of other ships. Note that this shipwreck was originally thought to be named the Olympia Maru and was then called Taiei Maru. The shipwreck formerly known as Taiei Maru is now believed to the Okikawa Maru while the Olympia Maru is the ship formerly called Ekkai Maru, Morazan Maru or Tangat Wreck. Confusing? You bet! The planes attacked the ships in Coron Bay and the ships to the west first. After a frenzied 45 minute attack the planes left, leaving behind numerous sunken ships. It is reported that the IJN Akitsushima was the first to be attacked and then they went for the Taiei Maru. She was soon hit and on fire, fuelled by the oil in her tanks. From my examination of the wreck, there appears to be three direct hits on the port hull side at the bow. The ship did not sink and drifted away from her anchorage. It is said that after another attack in early October 1944, the Taiei Maru finally sank on 9 October 1944. Most of the ships anchored around Coron were also sunk. Today 14 of these wrecks have been located and most can be dived from Coron. See my Coron Page for more information. There were at least six ships called Taiei Maru in Japan during World War II, so it was difficult to find out which of these, if any, is the one sunk at Coron. Until 2012 I was of the opinion that it was the Taiei Maru as Peter Heimstaedt had insisted to me it was the Taiei Maru and that the Ekkai Maru had been sunk in Manila Harbour. It seems he has changed his mind again in the past few years. On 27 November 1907, the SS Manco was launched from the Scott's Shipbuilding and Engineering Company Ltd of Greenock, Scotland. The new vessel was built as a passenger/cargo vessel. 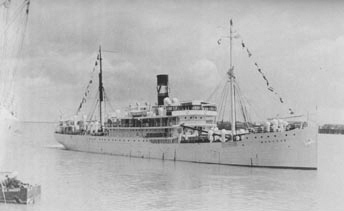 The Manco was built for the Iquitos Steamship Corporation, a result of the combination of the Booth Iquitos Steamship Company and the Red Cross Iquitos Steamship Company. The Booth Steamship Company (1901) Ltd owned both the new company and the old ones (I think). She was 300.3 feet long, a width of 45.2 feet and displaced 3,140 tons with accommodation for 65 First and 92 Third Class passengers and four holds with 154,940 cubic feet of storage. 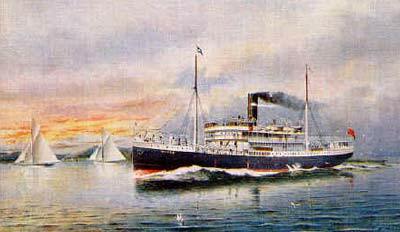 The ship was a coal powered steamship with a single Scott's triple expansion engine when built giving a maximum speed of 12 knots. The Manco was finished in early 1908 and sailed on her maiden voyage on 15 February 1908. Leaving Greenock (almost a suburb of Glasgow), she sailed via Hamburg and various ports at the mouth of the Amazon River and more than 2000 miles up the Amazon River to Iquitos in western Peru. The ownership of the ship transferred to the Booth Line in 1911 and she was used between Britain and northern Brazil or between New York and Brazil. During World War I, the Manco served in the Royal Navy as a fleet auxiliary ship under her own name. 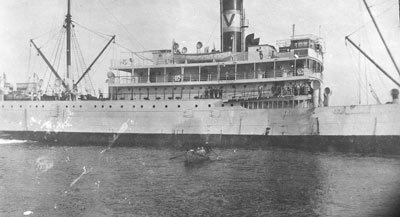 In 1921 the Manco was purchased by the Vaccaro Brothers Steamship Company and renamed as the SS Morazan after the Honduran patriot. At the same time, the boilers of the vessel were converted from coal to oil. The 302 tons of oil she carried could power the vessel on a return trip from Central America to New Orleans and return with her loads of bananas and humans. The Third Class accommodation were probably still in use, but it was not marketed in America. 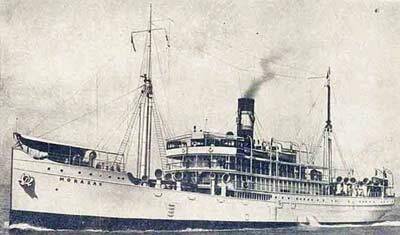 The Vaccaro Brothers Steamship Company incorporated its business as the Standard Fruit and Steamship Company of Delaware, USA, in 1923. The Morazan's ownership was passed to a subsidiary, the Mexican American Fruit and Steamship Company. In 1927 the name of the company changed to American Fruit and Steamship Company and in 1933 ownership of the vessel was transferred to the Seaboard Steamship Company, owned by the Standard Fruit Company. She was still engaged in carrying bananas from Honduras to New Orleans but was soon transferred to the Mexico to New Orleans run. Each round trip was 12 days. 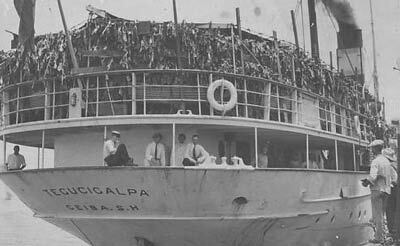 The home port appears to have been La Ceiba, Spanish Honduras (remember this for later). In 1941 the SS Morazan was sold with some sisterships to the Hong Kong company Wallem and Company via brokers Messrs Blidberg, Rothschild and Company. The sale price was US$200,000. The SS Morazan was apparently seized by the Japanese on 8 December 1941 in Shanghai, China. This was the first day of the Pacific War (the attack on Pearl Harbor occurred on 7 December and this was about 4 am on 8 December in China). The ship was renamed Ekkai Maru and assigned to the Japanese war effort but I have not yet found out what she was used for. It was presumably renamed at this time. 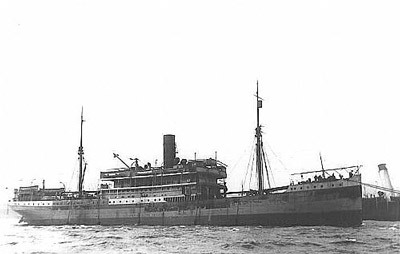 I do not think that the new name was Morazan Maru but Ekkai Maru, even though at one time the wreck formerly thought to be the Ekkai Maru was more popularly known as Morazan Maru. In late September 1944 with some Japanese ships, including a convoy of 12 Japanese ships, taking refuge in the Busuanga Island area of the Northern Palawan group of the Philippines. Eight of the ships were anchored in Coron Bay, the rest to the west and at least one on the northern side of Busuanga Island. The Ekkai Maru was anchored in the area between Tangat and Lusong Island with a number of other ships. 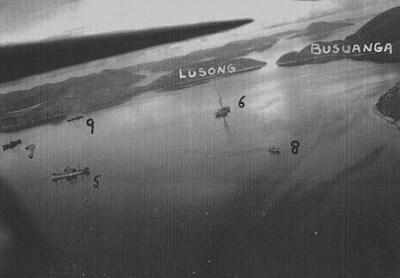 The planes attacked the ships in Coron Bay and the ships to the west first. After a frenzied 45 minute attack the planes left, leaving behind sunken ships, including the wreck of the Ekkai Maru, formerly SS Morazan. Today 14 of these wrecks have been located and most can be dived from Coron. See my Coron Page for more information. Located on the north-eastern side of Lusong Island, the Ekkai Maru is a smaller vessel than some of the other wrecks in Coron. Like most of the Coron wrecks, it also is a freighter but this one lies on its starboard side in 25 metres of water. When I dived it we anchored at the stern and after a quick look at the rudder and prop shaft hole we swam a short distance over the hull before entering a doorway. This takes us into the rear hold and we have a very quick look around. As I mentioned, the true identity of this wreck has not been established till the late 2000s. One thing that confirms it is really the Ekkai Maru, ex-SS Manco and ex-SS Morazan, is that at the stern there are some letters visible. These are CEI and then some spaces and then SH (some reports say BH but SH must be correct). It was assumed that this was part of the former name of the ship. However, it is really part of the name of the home port of the ship. 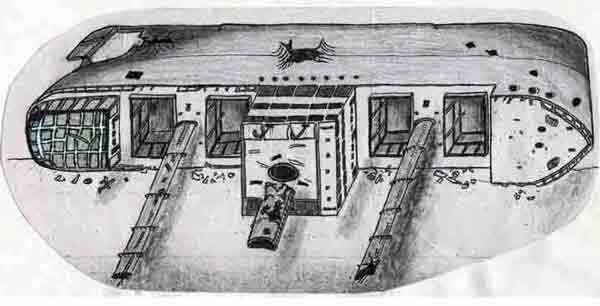 Remember it was La Ceiba (thus CEI) and the country was Honduras, also known as Spanish Honduras (SH). See the photos above of another ship that had La Ceiba as its home port. Thus it is certainly the Ekkai Maru. Unfortunately we are only staying one night in this location and have to fly out around lunch time tomorrow. For this reason, we have to dive very conservatively to ensure we do not suffer DCS. We swim along the 'tween decks into the third hold. This immediately reminds me of the SS President Coolidge in Vanuatu. Although it is a fraction of the size of the Coolidge, swimming along this way is very similar to some sections of the larger American. Down and up, under and over we go before we pass the engine room and funnel. The engine has been partly salvaged, with a large hole cut in the port hull to facilitate this work (again, like the Coolidge). We only spend a few seconds here before continuing on our way, along the same passageway we have been using. This is on the port side of the wreck and I assume that you can do the same thing on the other (deeper) side of the wreck. We pass another two holds and finally exit the wreck through another door right near the bow. I am following someone and before I get out of the wreck he has again disappeared inside another hole. I see that there are three bomb holes here. I look in a few before seeing his torch lighting up the dark interior. My other buddy and I enter and examine a few areas before we all return to the hull. We decide to spend the rest of the dive on the hull which is mostly shallower than 15 metres. We have a look at the outside of the vessel, especially the bridge, holds and kingposts. The funnel is lying on the sand below its original location. Like the other wrecks here, there is some excellent soft coral growth and not bad fishlife, the highlight of which is a large school of razorfish. Razorfish are quite small fish which swim forward while pointing vertical. A great sight. This has been very good dives. While not of the same calibre as the SS President Coolidge or those in Chuuk Lagoon (being salvaged and mostly without the original freight inside), the wrecks at Coron are ideal for those wreck divers who have already been to Chuuk, Santo and the Solomons. After the dive we again relax on our trip back to Coron. Gunter (of Discovery Divers) has placed an esky on the banca and we have a beer or two and relax as the sun drifts towards the horizon. What a great day's diving and a fantastic location, skimming over the millpond water, a beer in hand, interesting people to chat to and a good book to read. Life can be pretty good! A video I took in 1997 using Hi8 video. Personal conversations with researcher Peter Cundall, 22 September 1997 and email dated 28 September 1997.